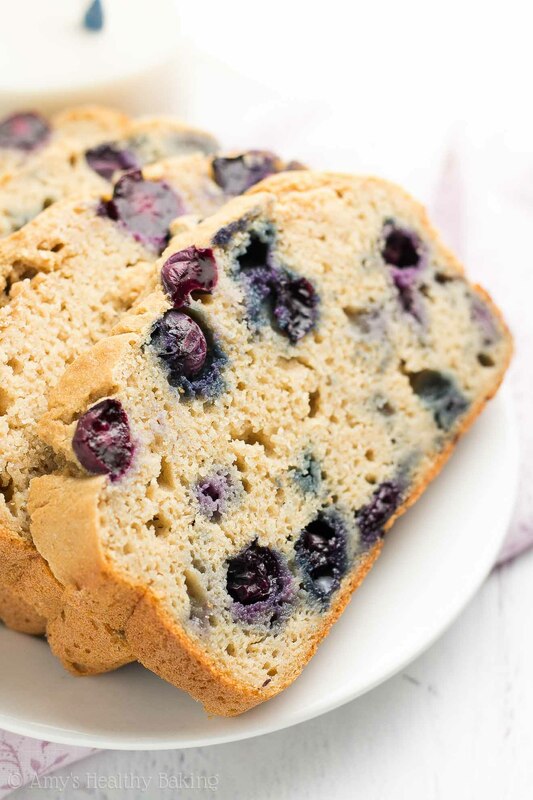 An easy, no-mixer-required recipe for tender vanilla pound cake full of juicy blueberries! 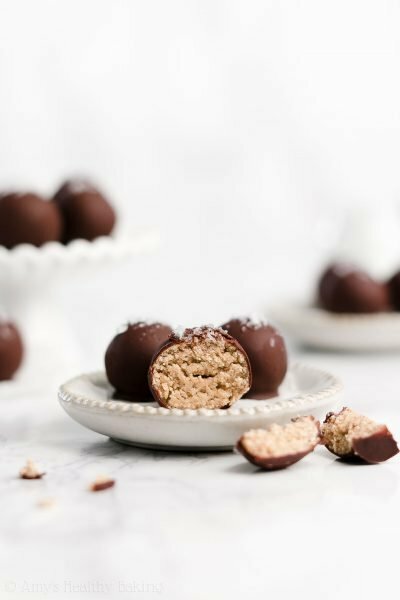 Secretly guilt-free with just 134 calories & no refined flour or sugar! In high school, shortly before our family vacation to New York City, my grandpa gave me a copy of the movie, “You’ve Got Mail,” which took place in the Big Apple. I immediately watched the cute chick flick, falling in love with Meg Ryan and her online romance story. Towards the middle of the movie, her character plans to meet her online suitor for coffee one evening at a Manhattan café, with a dimly lit yet cozy interior of red brick walls and a vast display case of desserts. When I discovered the place actually existed and was only a few blocks from our hotel, I easily convinced the rest of my family to stop by on our trip. When we stepped inside, we were completely amazed by the sheer number of desserts… And the length of the patrons in line! We joined the queue, and I was secretly grateful for the extra time to study the huge variety of options before placing my order at the register. 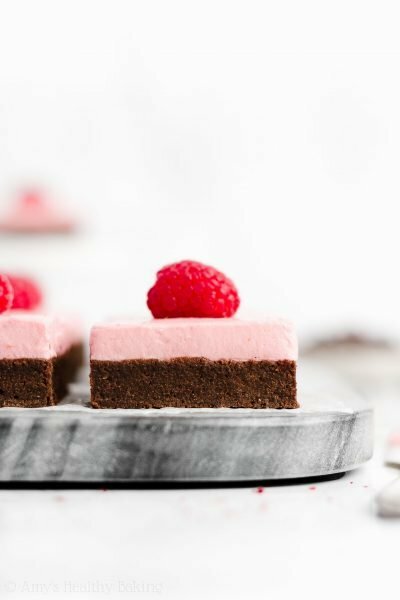 Although I finally settled on an over-the-top chocolaty and decadent cake slice (no surprises there… I published my chocolate cookbook for a reason! ), a platter of unassuming thick pound cake pieces still caught my eye as I waited in line. Something about their comforting simplicity called to me, even though I eventually passed them by. 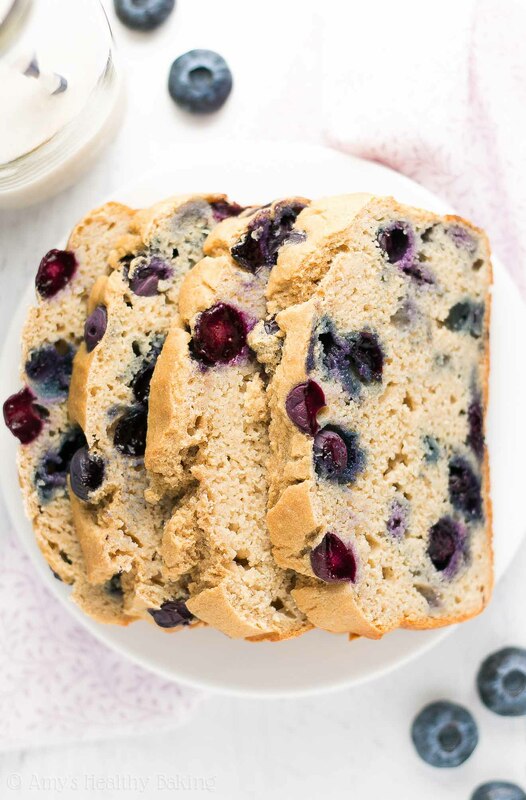 When Grandma and I listened to songs from the movie’s original musical “She Loves Me!” recently, that memory floated to the forefront of my mind, and I decided to make this Ultimate Healthy Blueberry Pound Cake in honor of that family vacation. It’s just as tender as the café one looked, but this one contains no refined flour or sugar and only 134 calories! In researching pound cakes, I learned they earned their name because they included a pound of each of the following ingredients: flour, sugar, butter, and eggs. Yikes! That’s a whole lot of calories… So let’s talk about how we’re going to shave off most of those in this healthier recipe! For the rest of this cake’s tender texture, you’ll mix Greek yogurt into the batter! Although you probably guessed that already if you’ve been around my blog a while… You know how much I ♡ it! Greek yogurt adds the same moisture as extra butter or oil for a fraction of the calories, and it gives your pound cake a protein boost, too! Instead of all-purpose flour, you’ll use white whole wheat flour (like this). White whole wheat flour earned its name because it comes from a special type of white wheat (it doesn’t actually contain any all-purpose flour! ), whereas regular whole wheat flour comes from a heartier variety of red wheat. White wheat has a lighter taste and texture, yet still has the same health benefits as regular red wheat, which makes it perfect for this tender cake! 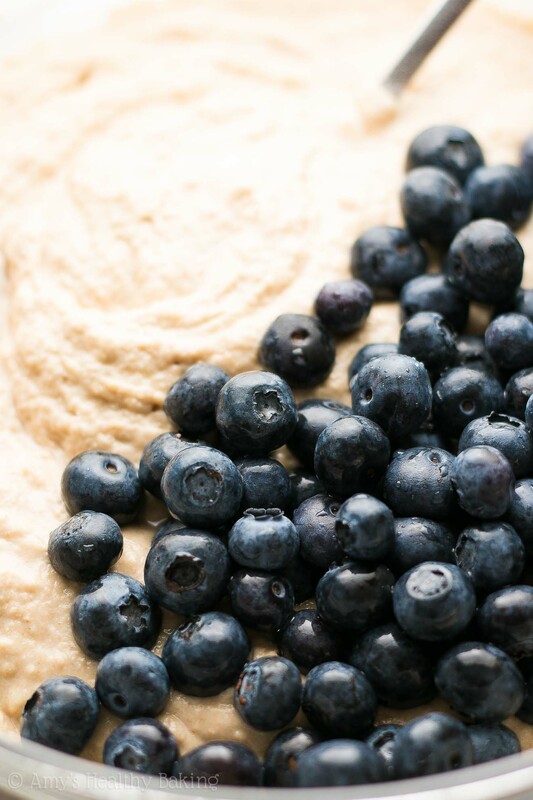 And now for my favorite part… Those fresh juicy summery oh-so-irresistible blueberries! 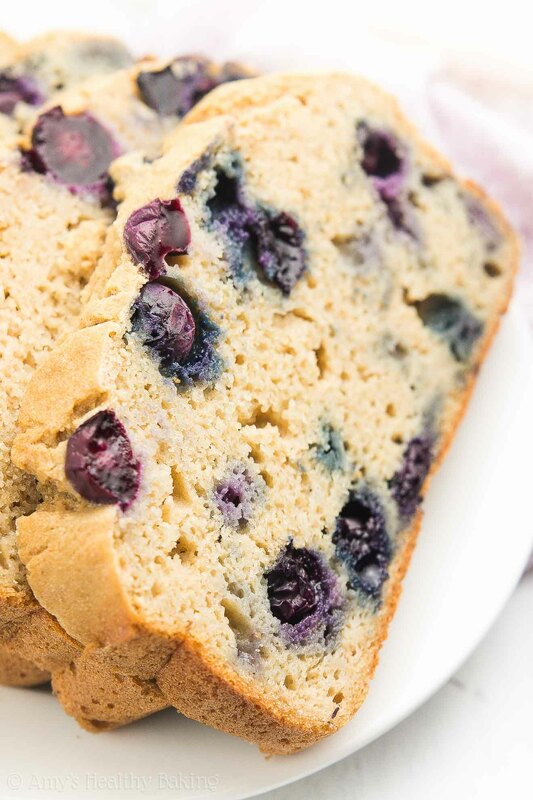 Fresh blueberries will always yield the best results in this cake, especially in the appearance department. Frozen ones tend to stain your batter gray… Not so appealing! Just look at those bright pops of purple! ? I’m positive this one beats the indulgent slices I saw in NYC… ??? And when you make your own, remember to snap a picture and share it on Instagram using #amyshealthybaking and tagging @amyshealthybaking IN the photo itself! (That guarantees I’ll see your picture! ?) I’d love to see your pound cake and feature it in my Sunday Spotlight series! This tender pound cake is always a huge hit with my family, and it’s so easy to make! No mixer required—the best kind of recipe, in my book! Leftovers will keep for at least one week if stored in the refrigerator in an airtight container or tightly wrapped in plastic wrap. Preheat the oven to 350°F, and line a 9x5” loaf pan with foil. Lightly coat the foil with nonstick cooking spray. To prepare the cake, whisk together the flour, baking powder, baking soda, and salt in a medium bowl. In a separate bowl, whisk together the butter, egg whites, vanilla extract, and stevia. Stir in the Greek yogurt, mixing until no large lumps remain. Stir in 2 tablespoons of milk. Alternate between adding the flour mixture and remaining milk, beginning and ending with the flour mixture, and stirring just until incorporated. (For best results, add the flour mixture in 3 equal parts.) Set aside 2 tablespoons of blueberries, and gently fold in the rest. 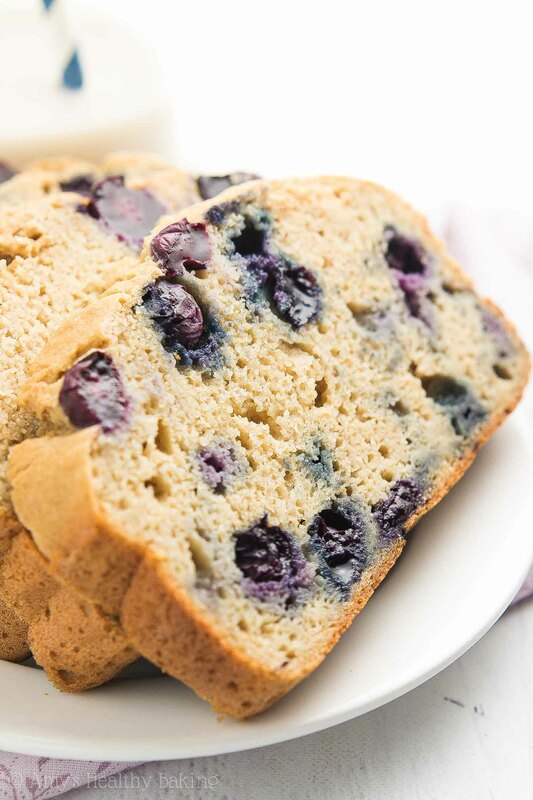 Spread the batter into the prepared pan, and gently press the remaining blueberries on top. Bake at 350°F for 50-60 minutes or until the top feels firm to the touch and a toothpick inserted into the center comes out clean. Cool in the pan for 10 minutes before lifting out the cake by the foil and transferring it to a wire rack to cool completely. Notes: For the gluten-free flour, use the following: 1 ½ cups (180g) millet flour, ¾ cup (90g) tapioca flour, ½ cup (60g) brown rice flour, and 2 teaspoons xanthan gum. Most store-bought gluten-free flour blends will work as well, if measured like this. I do not recommend substituting for the vanilla stevia, if at all possible. (It’s one of my favorite ingredients, and you’ll use it in all of these recipes of mine, too! I buy it online here because that's the cheapest price I've found.) However, if you really prefer to omit the vanilla stevia from the cake, substitute 1 ¼ cups (240g) granulated sugar and reduce the milk to ½ cup, but the cake will no longer be clean-eating friendly. You may substitute 1 ¼ cups (240g) coconut sugar and reduce the milk to ½ cup to keep the cake clean eating friendly, but it will be much darker in color. The baking time may vary with either of those substitutions as well. Frozen and thawed blueberries that have been patted dry to remove any excess moisture may be substituted for the fresh. They may stain the batter a light gray color. 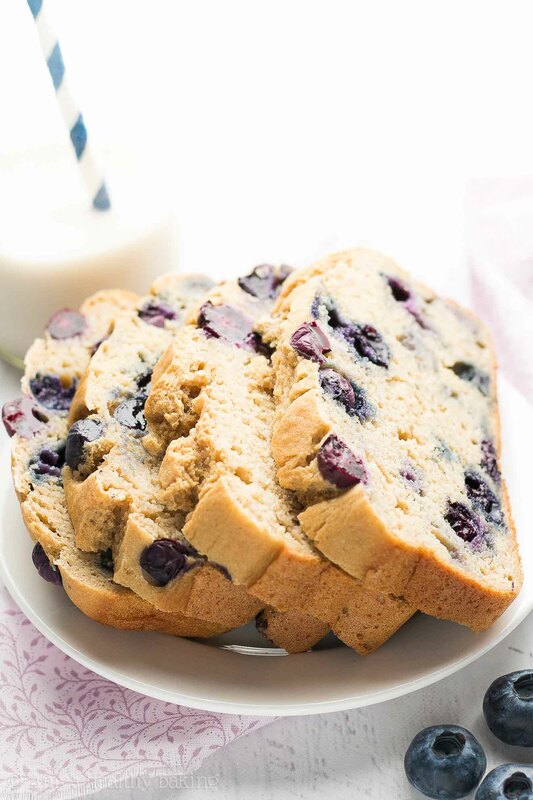 ♡ …and the rest of her healthy pound cake recipes! Lemon Poppy Seed Muffins, just wondering if the amount of xanthan gum was too much when making them gluten-free. I made them last week and they were so thick and came out so hard. They tasted great, but were hard. 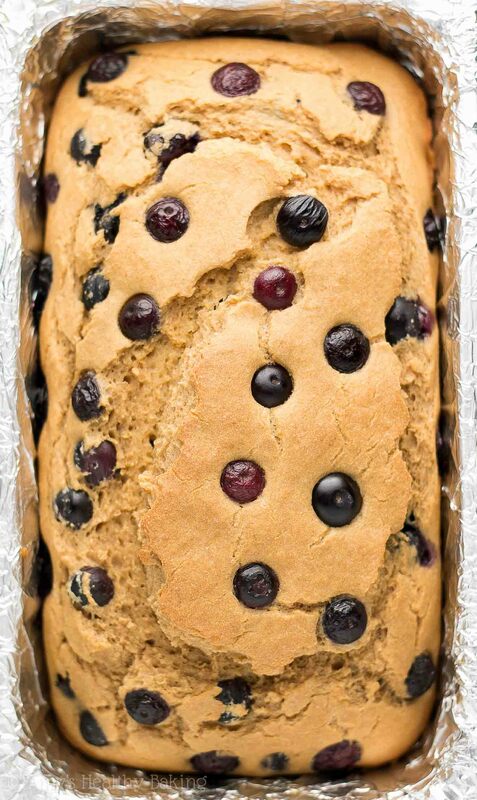 I hope to make this blueberry pound cake and noticed it too has 2 tsp of xanthan gum also. Just wanted to make sure that was correct. 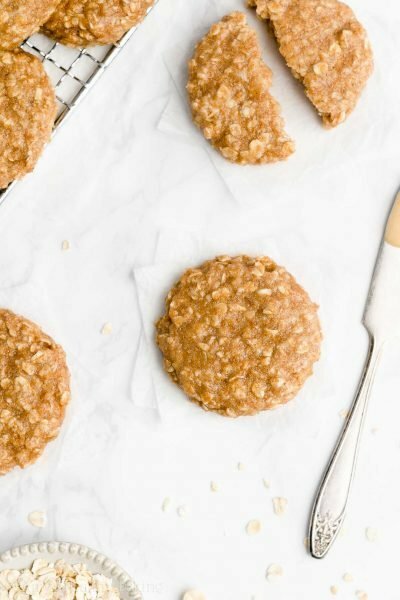 Thank you making these healthier versions of baked items available for us. Trying to keep our diet low sat fat and lowered in carbs. Hi Amy… your blueberry pound cake came on my pinterest feed and I. must say they just looked so inviting… I generally stay away from pound cake due to the amount of butter/sugar/eggs but your version intrigues me… I will be more than happy to try your recipe out.. just a quick question, although you don’t recommend it but can I sub vanilla stevia for agave syrup? 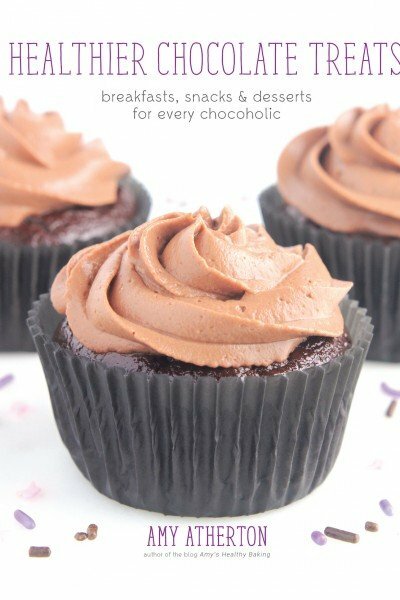 it’s just that I have that now in my pantry and I really wish I can start baking now rather than waiting to pop to my usual health food store which is not as near as I’d like it.. if yes, will it be the same amount? I really appreciate your interest in my recipe Sarah! If you’d like to use agave, then you’ll need 1 ¼ cups. Omit the milk. The baking time may vary, so use the toothpick test (when inserted into the center, it should come out clean!) to tell when your pound cake is done. 🙂 I can’t wait to hear what you think of it! Hi Amy! Always look fwd to your recipes ? 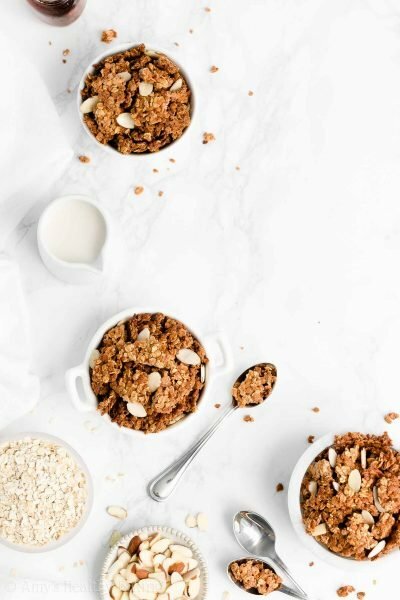 What do you think of replacing the milk & oil with Almond Milk & applesauce instead? 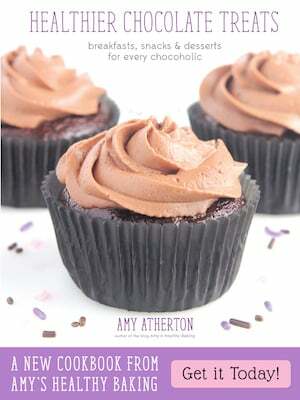 So excited to relieve stress with baking this today!? I really appreciate your interest in my recipe Kruti! I’ve already answered your milk question in the Notes section underneath the Instructions. It can be easy to miss! Do not substitute applesauce for the oil. The oil is required to produce the correct texture; without it, your pound cake will turn out tough and gummy. 🙂 I can’t wait to hear what you think of it! Would replacing the 4 egg whites with 4 whole eggs make much of a difference in the baking of this cake? I really appreciate your interest in my recipe, Connie! You can definitely add 4 whole eggs to the batter. The baking time may increase slightly, but the flavor will remain the same. 🙂 I can’t wait to hear what you think of this pound cake! It had more of a scone like texture, possibly because I used regular whole wheat flour. That’s what is available in my small town in Norther Ontario. That’s not a negative for me though. It was a great scone texture, in my opinion, crusty on the outside and moist but dense on the inside. The Stevia In The Raw that I used didn’t make the loaf sweet enough for my tastes. Again, that’s the Stevia available, and I was surprised to find it at all, but I guess there are actually a lot of diabetic people here. I imagine even at double the amount, it still won’t be a sweet bread, like commercially produced blueberry muffins or pound cake, but it will be a good scone. I will definitely make this again, and keep working on it. I really appreciate your interest in my recipe Jennifer! I’m happy to help you sort through the sweetness issue that you saw. How much of the Stevia in the Raw did you use in place of the vanilla stevia? I used an equal amount to your vanilla stevia.